Stretch and mobility. something to keep you going between massage treatments. Pregnancy Massage: Kareena has recently received massage training specifically for pregnant mums. You and your bub will be in safe hands with Kareena. Cupping therapy is an ancient technique in which a local suction is created on the skin. This effectively mobilises blood flow in order to promote healing. Cupping therapy is beneficial for myofascial and trigger point release, as well as mobilisation and relaxation. It improves the structural integrity of connective tissue allowing relief from general aches and pains. Kinesiology tape, which you may have seen sports people wearing, can be used to treat sports and non-sports injuries including shin splints, plantar fasciitis, knee and back painand oedema. The tape is soft, stretchy and conforming and lasts 2-5 days. Research shows it microscopically lifts the skin away from the muscle and fascia below, creating a decompressing effect. It provides external support and neuromuscular feedback, assisting with pain relief and recovery. So what’s happening with natural therapies and private health funds? I get asked this question a lot! First of all REMEDIAL MASSAGE IS STILL COVERED. So long as your therapist has approved provider status then its business as usual. That’s the good news for people who need and love remedial massage therapy. However it’s not so good for some other therapies. For more information go to the Department of Health website. Kareena has just completed her fourth Ortho-Bionomy weekend training course in Hobart. This weekend was An Exploration of Movement, instructed by Frank Heslin. Kareena enjoys incorporating this gentle technique in her treatments and sees significant positive changes in her clients. 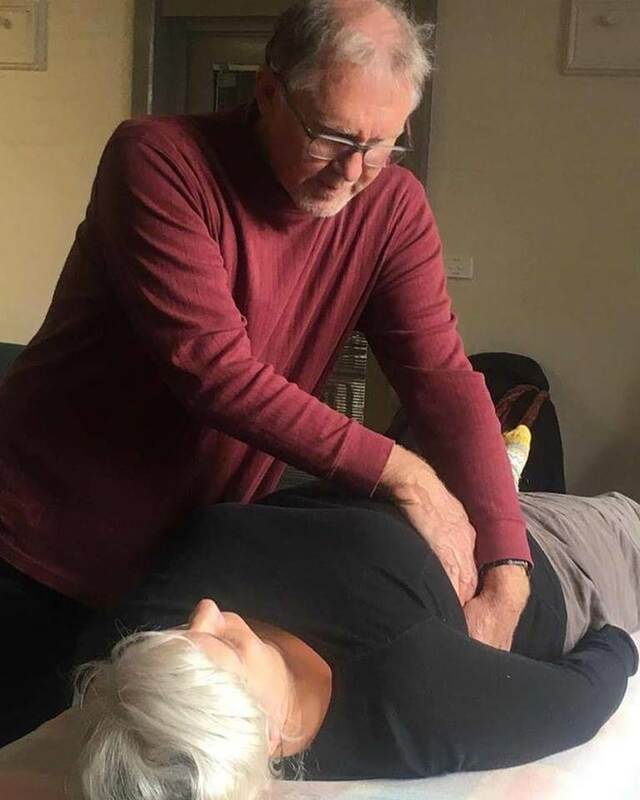 'Ortho-Bionomy is a gentle, non-invasive method of therapeutic bodywork which uniquely addresses pain and stress patterns and promotes structural balance and ease' Ortho-Bionomy Australia. Interested in the latest research into the role of the brain and mind in chronic pain? Then check out Body in Mind for more info, and watch this quick video about understanding pain. Is it time to get moving? Are you looking to add something more to support your regular massage treatments? My goal is to guide you on your path to health and wellness. Mark at Integral Movement offers stretch and movement sessions online, face to face and shares lots of great resources on facebook. Give it a try and feel the difference! In 2017 Kareena received further education and training, completing a Certificate Of Pregnancy Massage with Pregnancy Massage Australia. 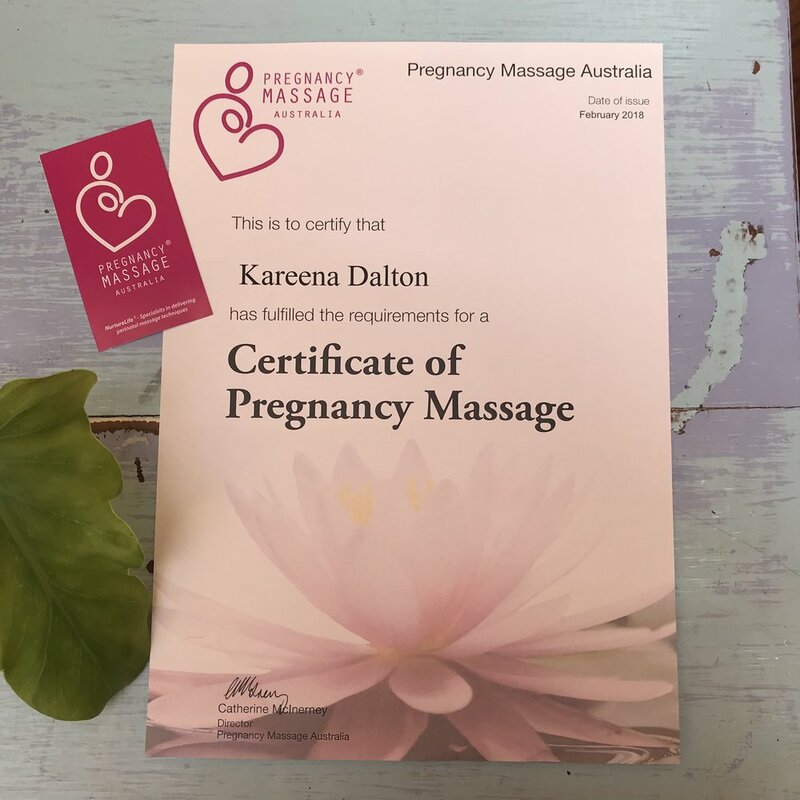 This thoroughly enjoyable and rewarding course provided Kareena with many tools and techniques to safely and effectively massage pregnant clients experiencing postural changes, aches and pain. Kareena enjoys treating her clients through the many stages of motherhood; pre, during and post pregnancy. Pregnancy massage helps to support the many individual mental and physical changes a mother experiences during pregnancy. Kareena focuses on connecting mum and bub in a safe and supportive environment allowing you to feel completely nurtured. After taking a full client health history, Kareena will recommend the safest and most comfortable massage position for each client, and discuss a treatment plan. Prone (face down) and supported supine (face up) positions may be fine for some clients depending on the stage of pregnancy and other factors. Each client has specific, individual needs, which require a deeper understanding of the needs of pregnant women. How does the side lying position benefit a pregnant client? abdominal connection and massage to support many changes including constipation, lower back and thoracic pain. Kinesiology tape, which you may have seen sports people wearing, can be used to treat sports and non-sports injuries including shin splints, plantar fasciitis, knee and back pain and oedema. The tape is soft, stretchy and conforming and lasts 2-5 days. Research shows it microscopically lifts the skin away from the muscle and fascia below, creating a decompressing effect. It provides external support and neuromuscular feedback, assisting with pain relief and recovery. Elonda Massage Therapy - Hobart. Remedial massage is the use of a number of soft tissue techniques designed to relieve pain and tension from injury or stress. Remedial massage can improve flexibility and relieve headaches and back pain through the application of trigger point, deep tissue or myofascial techniques.